Desktop Metal has expanded production capacity of the Studio System™, the world's first office-friendly metal 3D printing system. 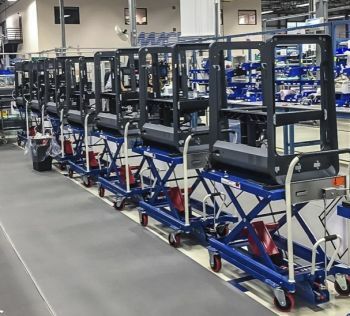 With expanded production capability, the company is now shipping at a rate of 550 complete systems per year, with a two-week delivery time for new orders to customers throughout the US and Canada. "Leading companies, such as Ford, Google's ATAP, Goodyear, BMW, and ProtoLabs, are now benefiting from the ease of use and accessibility provided by the Studio System," said Ric Fulop, CEO and co-founder of Desktop Metal. "To meet continued demand, we have scaled up production capacity to allow us to deliver complete systems for fast installation." Over the past six months, Studio Systems worldwide have fabricated more than 8,000 parts. Key use applications range from functional prototyping of extruder nozzles and shock absorber pistons; to jigs & fixtures including robotic end effectors and brake caliper fixture; to manufacturing tooling of zipper molds inserts and extrusion dies; and low volume production of gears and motor mounts. Each of these benchmark parts has shown drastic cost reduction -- some by as much as 90 percent relative to machining and selective laser melting -- as well as speed in fabrication, producing parts in days instead of weeks or months. The Studio System is designed to make metal 3D printing more accessible, enabling design and engineering teams to print metal parts faster, without the need for special facilities, dedicated operators, or expensive tooling. The three-part solution, including printer, debinder and furnace, automates metal 3D printing by tightly integrating through Desktop Metal's cloud-based software to deliver a seamless workflow for printing complex metal parts in-house -- from digital file to sintered part.